On Saturday, October 10th Richard Wright's collection of rare and important dolls was auctioned by the Skinner auction house. When I heard that three Izannah dolls were going to be auctioned, I decided to drive the 5 hours from Bangor, Maine to Marlborough, Massachusetts to see the dolls in person. unassuming, but oh the treasures that were inside! Inside there was a sense of camaraderie as people who had known Richard Wright reconnected with one another and viewed the spectacular collection he had crafted. Andy Ourant, consulting specialist and auctioner, commented that the friends and acquaintances of Richard Wright were privileged to gather to compete for something from Richard Wright's collection. There were so many wonderful things in this collection. 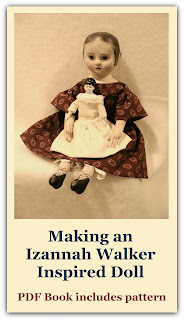 But since this is a blog about Izannah Walker dolls, we will focus on those. When the bidding was opened for the first Izannah doll above you could feel some excitement in the air. The doll was small - 14 inches - and was wearing a dress that was described as a "cotton dress with frail silk blue and white check trim." One theory is that the dress would have originally been all silk blue checked trim, and that the white was the lining of the dress. Bidding went along at a fast clip until it ended at $11,000, within the estimate printed in the auction catalog. As the gavel came down, a cheer went up. It was clear that many of the people were rooting for the prevailing bidder to win that Izannah doll! 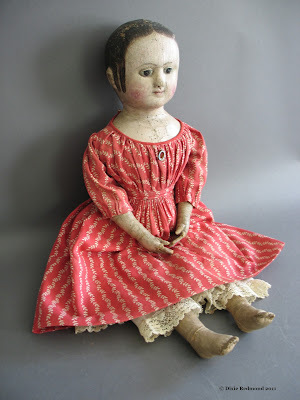 The doll above is a classic Izannah Walker doll with two side curls in front of the ears.This doll was won by the same bidder as the doll above with a final bid of $10,000 - the auction estimate range being $15,000 - $18,000. Finally, the "Lady" Izannah Walker Doll was auctioned. Now these dolls go on to their new loving homes. This is the best dress that I saw and also her hat!!! She looks so beautiful! !